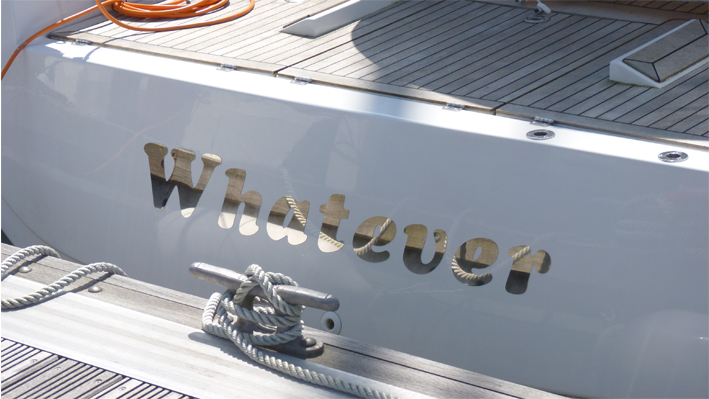 Discount Boat Names for Jeanneau Owners! We also sell bow plates and sheets, all are in marine grade mirror polished 316 stainless steel so they will withstand the harshest of environments. They are easy to fix and can be formed over tight curves. We also have easy self stick and standoff options. New to the range is LED illuminated lettering! There are no external electrics within the LED/Fibre Optic letters as they are illuminated by their own long life low voltage high intensity LED light emitter safely tucked away from the elements. Using highly energy efficient LED’s, the power consumption is incredibly low. The LED Letters can be found in the options of our regular letters pages and are also available in black acrylic. Boat names are one of our specialities also port names and SSR numbers in ready-made stick on stainless steel for that finishing touch to your boat. They will fix flat to almost any surface and won’t crack, peel or fade like vinyl. Available in a range of sizes and they are a fraction of the cost of bespoke letters. Our small lettering starts from £1.99. Ordering online from www.techstainless.com is quick and simple. We take Paypal and everything is normally kept in stock. Check out our prices, you may be pleasantly surprised. What’s more for Jeanneau owners, use JEAN10 in the coupon section of the ‘View Cart’ page for a 10% discount!